Even though Google has actually made its own self-driving car that it is testing out right now, the company has said that it doesn't actually want to become a car manufacturer. Speaking at the Frankfurt auto show in Germany, Google managing director for central and eastern Europe, Philipp Justus, said the company does not ntend to become a vehicle manufacturer, Reuters has reported. "That is not something we could do alone," Justus said at the event, adding "Google also does not intend to become a car manufacturer." The rumors of Google furthering its push was fueled earlier this week with news that ex-Ford and ex-Hyundai GM John Krafcik had been hired to lead the company's self-driving car initiative. 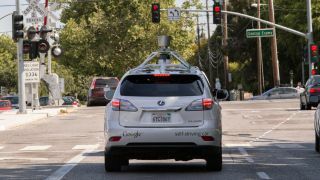 "This is a great opportunity to help Google develop the enormous potential of self-driving cars. I can't wait to get started," Krafcik had tweeted at the time. Justus explained that so far, Google had been working in partnership with the auto industry, including European automotive suppliers Bosch and zf friedrichshafen. But while Google will work in partnership with other car manufacturers, right now, the search giant doesn't plan on making and selling it's own consumer cars. What that means is that the self-driving tech Goolge is making could eventually be found in cars made by other companies. However, we should also note that Google could always change its mind in the future. After all, what's to become of Google's koala-resembling car?